Nico Pitney of Huffington Post has created a mosaic of the “Commander-in-Chief” of the U.S. military and his potential successor using thumbnails of the 4,000 American soldiers who have died in Iraq. “In remembrance of the 4,000 brave men and women who sacrificed everything for us – and the two men who would continue this great tragedy, despite the cost to our soldiers, our military, and our nation,” wrote Pitney. You can download the full-size image here. 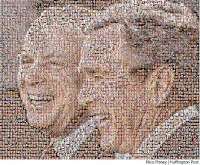 Since some photos of the deceased soldiers were unavailable, there are duplicates in the mosaic. Who to vote for as U.S. president?